Hello Adeline, it truly is an honor to feature you in our GatheringBooks Meet the Storyteller for the Month of October. We are actually having a “Keep Out! Stay Away – Diary Special” in celebration of your being a part of GatheringBooks for the month. Yay! 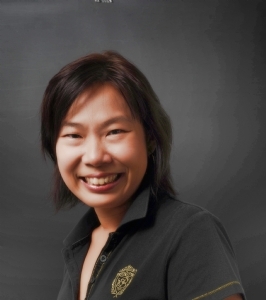 We now have one of Singapore’s national bestselling authors in our site! *Clap clap* indeed! Here are some of our questions, Adeline. How long have you been writing books for children? How many books have you published so far? Is there any special reason why you chose this particular genre? I started with writing picture books in 2006. To-date, I have written 16 books, 12 picture books, with No. 13 translated into Chinese, and 3 chapter books. I chose to write children’s books as I was reading lots of books, as a mum with three young kids! When did you discover you wanted to be a writer? I am aware that you are a student at Tisch Asia, could you share with us a bit about what your “school work” entails? Are you also planning on making or writing for films eventually? I got into Tisch on a scholarship. I’m really keen to pursue writing for films, to complement what I’m already doing. I see an opportunity to use short films to present stories, to reach out to tweens and teens who are looking for more exciting new media platforms for entertainment. I understand from the Book Club that I attended at the Arts house and some snippets of your talk during the AFCC that you also have some corporate background; can you tell our readers a little more about that? Do you think that this may have helped you somewhat in marketing your books and getting it out to more people? I spent half of my 15-year career in corporate public relations, the other half was in advertising, on the agency side. What I learnt actually taught me to be versatile in handling all kinds of writing, and maybe that’s the reason why I can switch between writing serious stuff, to something fun for kids. At Tisch, when I tell my American professors that I write children’s books for my career, they find it incredible. Reason being that my writing in Tisch borders on more edgy and ‘adult’ stuff! I won’t even ask about how you manage doing everything all at once because I believe I have written about that after hearing you talk during the Children’s book club organized by the National Book Development Council of Singapore. Suffice it to say, that I truly admire your discipline, dedication, and commitment to writing. It’s not like I have it all! I regret long nights rushing through my assignments, not being able to read as much to my kids as I used to; or having to put off a trip with my family during school holidays, because I have to rush a manuscript out for my publisher. But I tell myself that this is only temporary, as my books gain a steadier following on their own merit and appeal, I can relax a little more, and write purely for enjoyment. Right now, the stress comes from having to keep up with the pace of writing faster to get more books out, to create a loyal following. I feel that not enough readers know about my books. You’ve mentioned the Good Earth by Pearl Buck as one of your absolute favorites when you were growing up. Could you share with our GatheringBooks readers what it is about The Good Earth that appealed to you so? How has it influenced or inspired you in your writing? I’m not sure it’s classified as Children’s Fiction, but back in the late 70s and early 80s when I was growing up, no one really bothered to check what we were reading in school haha! What I identified with the story was its characterization. Wang Lung, O-Lan and the trials and tribulations the couple went through are things I still recall so vividly. The story taught me to create endearing characters that anyone can identify and empathise with. The themes in the book, of working hard to break out of the poverty trap, was something that also resonated, as I came from a humble background, books were the only way I could seek escapism. They provided solace and inspiration that I could do better in my life as well. What are some of the books that you liked reading to your kids when they were little? How about books that you’ve read when you were a child? Ian Whybrow’s Harry and the Dinosaurs series, Ian Falconer’s Olivia series and Julia Donaldson’s books – for my kids. Enid Blyton and Judy Blume when I was young; Catherine Lim, Pearl S Buck, Jeffrey Archer, Arthur Miller and Amy Tan when in my teens. What constitutes a good children’s book/ YA story for you? Characters with a never-say-die attitude on a quest to make good in life. 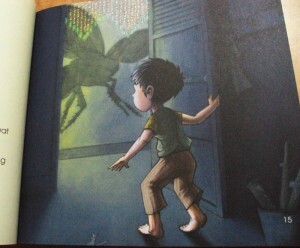 Who are some of your favorite children’s book illustrators? 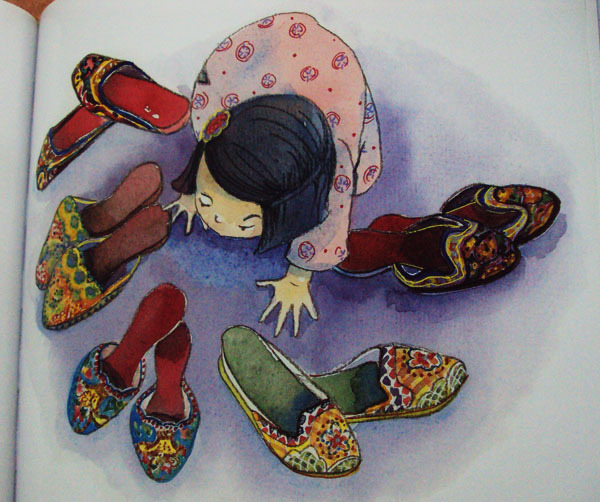 Ella’s Big Chance: A Fairy Tale Retold by Shirley Hughes remains one of my favourite illustrated children’s books. 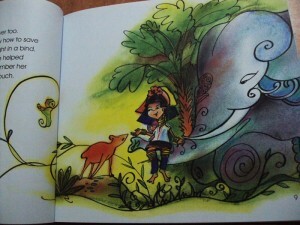 Other artists I like, Helen Ward, Julie Vivas (Possum Magic by Mem Fox). You have mentioned in your talk at the Arts House that as a writer, it takes “life experiences” in order to write meaningfully, how do you think has your experience in being a mother inspired you in some of the themes that you talk about in your books? I think most writers would agree that we should write from a place where we feel the most extreme emotions – hurt, regret, happiness, loss – even my professors at Tisch remind us that they need to identify with the character on the page as facets of the writer’s persona. What’s real on the page is real because it’s a genuine emotion experienced by the writer. I am 39 years old; the biggest challenge in my life right now is responsible parenting. I write what I know only, and at this point, it’s about the mother-and-child relationship in my books. What are some of the difficulties that you have encountered so far when you write? Finding time to juggle everything to my satisfaction – being a wife, mother, student and professional writer can be draining. Some days, I wish I could give up something. And most often, I wonder if going back to school was something that I had bitten more than I can chew. But it’s only two more semesters to go through, I think I can do it. How has your writing evolved through the years? What do you think are some of the most important lessons that you have learned in your journeys as a children’s book author that has strengthened your writing skills? The best stories that I had written were those that were honest and true. I didn’t do so well when I was asked to write stories that were commissioned. The best stories were not always the most popular ones either. But these were the stories that got me letters from readers, so it affirms what I know already, that what you write and read on the page have to come from somewhere real in your memory bank. Your first book Ben’s Friends from the Rainforest struck me as blending factual information with fiction – very Singaporean, lah! Haha. Was this a clever ploy on your end to get more readership for the book, seeing how assessment books and fact-based texts sell more here? It also says that the storyline is adapted from your experiences in the wild, could you tell us more about it? It’s the practical mum in me who wanted to create a book with a long shelf life! 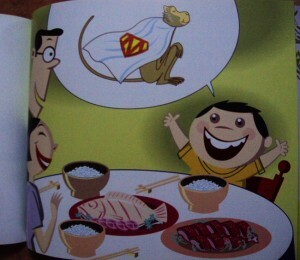 The two stories are based on incidents where a lizard strayed into our house, and when we came upon a monkey who stole a runner’s shirt in MacRitchie reservoir. 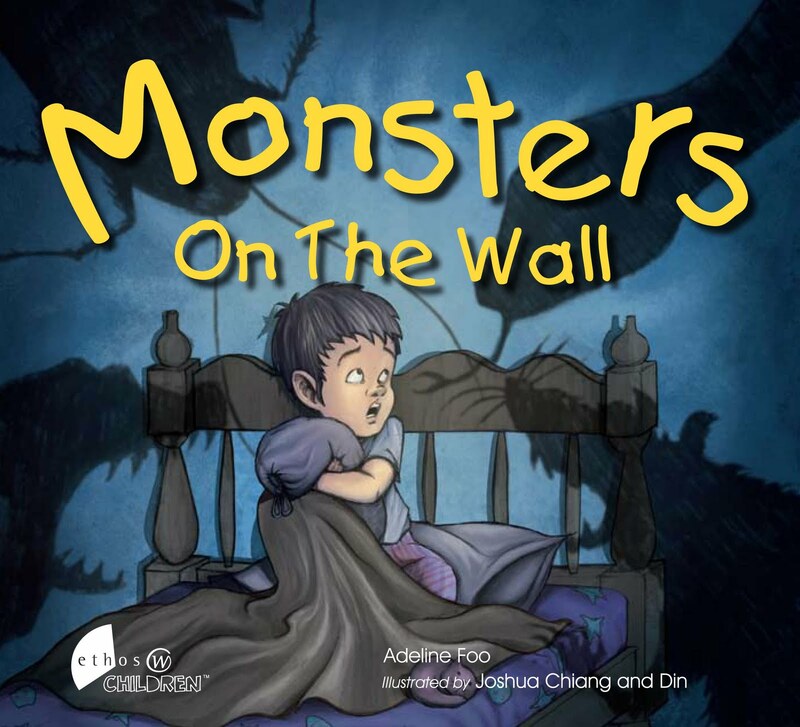 Monsters on the Wall speak to the child in us who continually sees creatures lurking in the shadows. 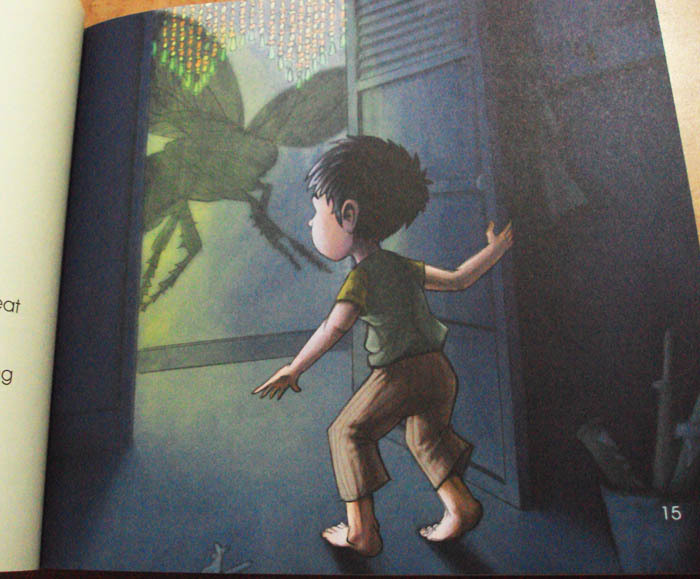 Here, the storyline focuses centrally on Kai-kai, the young boy, and his cat. Markedly, there are no grown-ups (moms or dads) in the narrative; is there any special reason for this? I think all my picture books do not portray a parent figure, except for the Peranakan stories. I believe kids can solve their own problems. 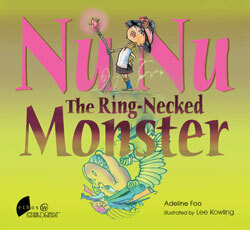 Nunu the Ring-necked Monster is said to have been inspired by a Chinese idiom. Could you tell us more about this? Some of the elements in the narrative are likewise reminiscent of the Gruffalo, yet it has a unique Southeast Asian taste to it with Nunu coming from the Padaung tribe of Myanmar, why this tribe in particular? Could you share with us what inspired you to do this book? It is the same idiom that Julia Donaldson used to write her story The Gruffalo. My version is about a child who tricked a tiger into believing that she’s a fearsome monster that all animals in the woods are fearful of. Kowling, my artist, has visited the Padaung tribe before and I believe in speaking to the artist first before deciding where to set the story. The colours of the Padaung tribe, together with her recollection of connecting with its people, brought the story alive. I love your Peranakan series, Adeline. I truly believe that you have established a very strong niche with Puteh. Not only have you effectively made full use of a very rich heritage in Singapore, you are communicating valuable facts, values, and an entire way of life and being using a child’s voice and a child’s heart – how instrumental was your grandmother, Puteh (to whom you dedicated The Kitchen God – in some of the details you have included in your story. Could you tell our readers as well who the Peranakans are and their role in Singapore’s history. The Chinese Peranakans are descendants of Southern Chinese traders who settled in Malacca and around the coastal areas of Java and Sumatra in the 14th century. By the 19th century, the Chinese Peranakans had moved to Penang and Singapore and forged a unique, hybrid culture which has remained a part of Singapore’s rich, living heritage. The early Singapore tycoons who made a huge impact in building schools to educate our children are largely Peranakans. Several of our early political leaders are also Peranakans. Their contribution has carved a mark on society, none other more deeply experienced than in our food culture, with the Chinese, Malays or Indians all able to cook facets of Peranakan dishes, as the culture has become imbibed in our food legacy. How has the journey been like for you as a writer as you create the character of Puteh? The jacketflap of The Beaded Slippers indicate that it has also increased your awareness of your own heritage; can you tell our readers more about this? 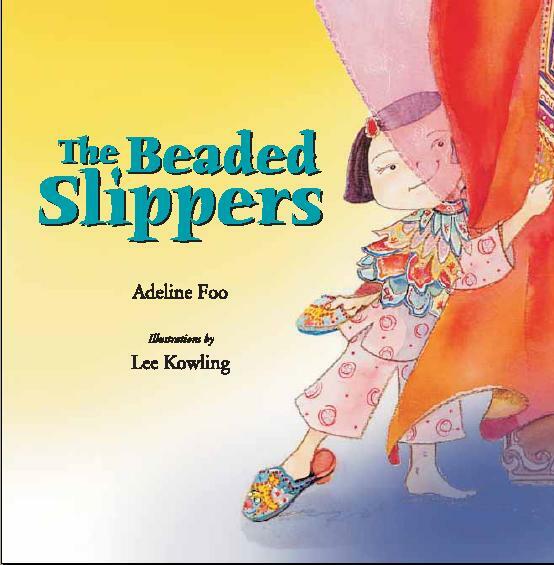 I love how The Beaded Slippers capture another facet of the Peranakan heritage with its focus on wedding rites and ceremonies and yes beadwork as seen through the wondering eyes of Puteh. What was your inspiration for this one? The artefacts in the Peranakan Museum carry remnants of my childhood which I still remember. My Peranakan grandparents were once well off, as my grandfather could speak and write in English and held a decent job in the British administration. But my father, being the last of nine children in the family, fooled around and didn’t complete his formal education. You can imagine what kind of a struggle he went through with the family, after WWII wiped out all the family’s savings. He never held a decent job, without any paper qualification. My mother’s parents were immigrants from Guangzhou, China. She was born here but spent 13 years of her initial life in Guangzhou. When she came back to Singapore, she was 13 and couldn’t speak a single word of English. You can imagine how hard she struggled with completing her primary school education. 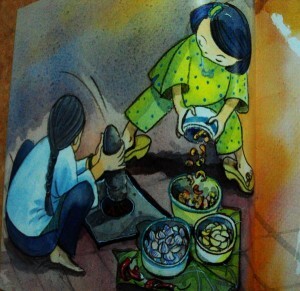 Her story of marrying my father and living with a large Peranakan family provided fodder for my imagination. I grew up hearing lots of ridiculous tales and superstitious beliefs that my grandmother’s family imposed. 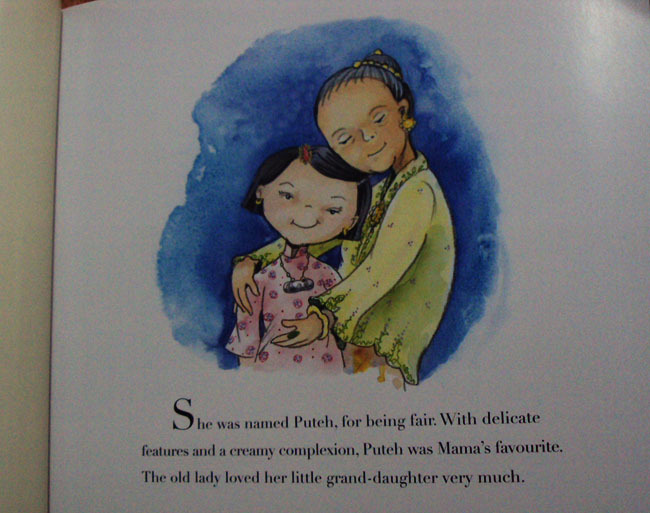 As much as my Peranakan stories were dedicated to my grandmother, Puteh, as these were memories of her, it was actually my mother who brought them alive for me. She used humour to regale me. It’s her “talk-story” or oral tradition which I should have dedicated my books to. When can we expect Book 3 of Amos? Any other new books in the works? Yes, Diary of Amos Lee #3, I’m Twelve, I’m Tough, I Tweet! is out in mid November (2010). It deals with Amos becoming a cyber bully victim when he runs against an enemy to be crowned the school’s first Tween Idol in a popularity contest. 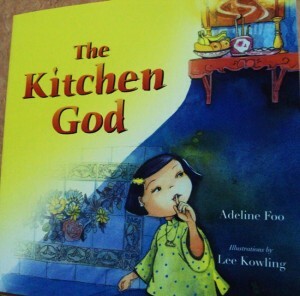 Thank you so much Adeline for being a part of GatheringBooks. It is such a privilege having you in our pages. 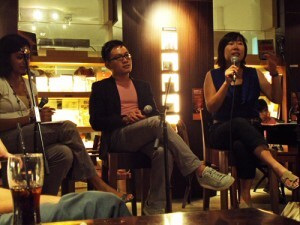 Adeline Foo’s Interview doesn’t end here. We asked her more about her Amos Lee Books. Head over to our blog or click on ‘book feature’ for more on the Behind the scenes of The Diary of Amos Lee. 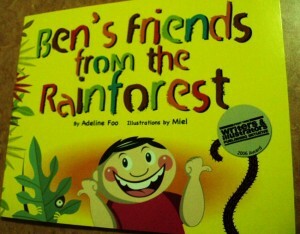 Books were lent to GatheringBooks by Adeline Foo.